In Noel Coward’s enduringly clever “Private Lives,’’ now at the Huntington Theatre Company in a diamond-sharp production directed by Maria Aitken, words can glitter or cut, charm or wound, ­seduce or repel. Part of what animates Amanda and Elyot, the on-again, off-again duo in Coward’s 1930 comedy about second (and third) chances, is their ongoing competition to have the last — or at least the best — word. Yet all that verbal acid (a substance invoked more than once in “Private Lives’’) tends to burn away the veneer of civilization. The sophisticated, veddy ­British banter keeps giving way to passionate declarations of love, then to equally passionate quarrels, and eventually to behavior that is downright … uncivilized. Before, of course, making its way back to love. Bianca Amato and James ­Waterston are just about perfect as Amanda and Elyot, a once-­married couple who bump into each other while on honeymoons with their new spouses and impulsively rekindle their relationship. Amato and Waterston execute the ensuing game of romantic round robin with style, dexterity, subtlety, and sizzling chemistry. Those qualities were apparently lacking in a 1983 pre-Broadway tryout of “Private Lives’’ in Boston starring Elizabeth Taylor and ­Richard Burton, even though their much-chronicled personal history lent a presumably juicy flavor of roman a clef to the proceedings. His star quality comes to the fore in a revival at the Huntington Theatre Company and an exhibit in New York. By contrast, director Aitken makes sure that the Huntington production is fleet in every sense of the word, whether insults or pillows are being flung. Amato cuts a regal, soignée figure — she can wring a laugh out of a single word, like “inveterate’’ — but she is also skilled at physical comedy. In his portrayal of Elyot, Waterston finds the balance between upper-class twit and reasonably dashing roué, a man to whom a woman like Amanda would plausibly be attracted. They expertly handle Coward’s stylized dialogue, managing to make us believe that this pair of insouciant, extravagantly outsized characters were indeed made for each other. Who else would have them? 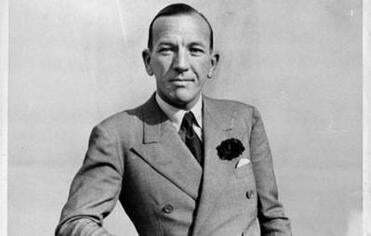 There’s no way, though, to avoid one dated and jarring aspect of “Private Lives’’: Coward’s jovial attitude toward domestic violence. This is the play that contains the infamous line, spoken by Elyot, that “Certain women should be struck regularly, like gongs.’’ Amanda crashes a phonograph ­record over his head in one scene, whereupon Elyot slaps her. 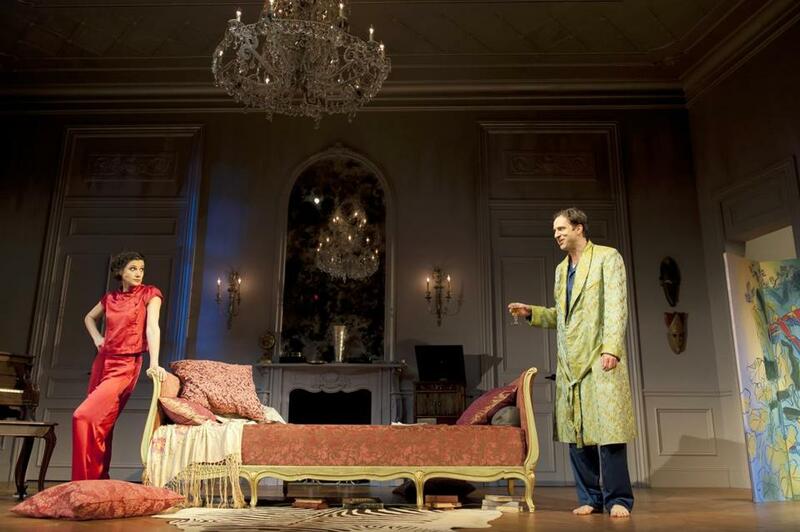 Though the second two acts of “Private Lives’’ take place in Amanda’s flat in Paris, the play opens on the terrace of a hotel in Deauville, France, a scene of such honey-hued beauty (created by set designer Allen Moyer) that the ­audience burst into applause on opening night before a word had been spoken. (Three cheers also for Candice Donnelly’s elegant costumes, especially the silk pajamas — blue for Elyot, red for Amanda — in the second act). Elyot is honeymooning at the hotel with his new, young wife, Sibyl, very amusingly portrayed by Autumn Hurlbert in a helmet of blond hair and an air of aggrieved rectitude. In the adjacent suite, unbeknownst to Elyot, are Amanda, and her new husband, Victor. The mustached Jeremy Webb is a major asset as the stout-hearted but oblivious Victor. (Boston favorite Paula Plum also makes brief but indelible appearances as a grumpy, sneezing maid). As “Private Lives’’ unfolds, there are flashes of genuine feeling amid all the idle chatter. Love matters to these characters; life does too. Don Aucoin can be reached at ­aucoin@globe.com.